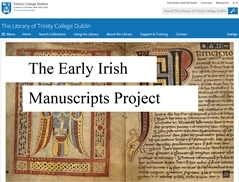 Precious Irish manuscripts from the Dark Ages have been conserved by Trinity College Dublin (TCD) following a three-year programme. The rarely seen manuscripts from early Christianity have been repaired, analysed and digitised and will be on public display, on a rotational basis, at the Book of Kells Exhibition at TCD. The manuscripts are the Codex Usserianius Primus, the Garland of Howth, the Book of Dimma, and the Book of Mulling. They join the Book of Kells, the Book of Durrow and the Book of Armagh to form the most pre-eminent collection of early Irish manuscripts in the world. The painstaking conservation project involved the treatment, technical examination and art historical study of the four priceless manuscripts. This included the repair of these fragile manuscripts as well as scientific analysis of the pigments. The manuscripts’ pages have also been photographed and published making them available to the public and researchers around the world for the first time. You can view them online here. Garland of Howth is a ninth century parchment manuscript. Associated with St Nessan’s monastery on Ireland’s Eye, off the coast of Howth in Dublin, it contains a copy of the four Gospels. Book of Mulling is an eighth century pocket-gospel, with ninth century additions and is associated with the monastery of St Mullin’s in Co Carlow. It contains a copy of the four Gospels, and features portraits of the evangelists Matthew, Mark and John, together with illuminated initials. Book of Dimma a late eighth century manuscript, possibly produced at Roscrea, Co Tipperary, contains a copy of the four Gospels. The name ‘Dimma’ refers to the scribe of Saint Cronan, who according to tradition was asked to write a gospel book in one day. He achieved this because miraculously, the sun did not set for 40 days. Codex Usserianius Primus is one of the earliest known surviving Irish manuscripts, dating back to the fifth or sixth century. It is not known where it came from prior to its acquisition by Trinity Library in the 17th century but annotation in early Irish confirms that it was in Ireland from an early date.